you are here: Home » Book Chat / Featured » What’s Your Favorite Children’s Mystery Series? What’s Your Favorite Children’s Mystery Series? Apparently this week is Mystery Series Week, so we thought we would celebrate by talking about our favorite children’s mystery series. I still like to read mysteries, but the ones I read as a child really stand out in my mind. They captivated my imagination, and I think trying to solve the mystery along with the story helped me develop critical thinking and problem solving skills. Plus, they were fun to read! So here are Amie, Jose, and my (Kristen) top picks for children’s mystery series. In junior high school I was really into the Fear Street series by R.L. Stine. Fear Street books were scary tales that often included a murder/mystery. There were written for a slightly older audience than Stine’s other scary series, Goosebumps. The great thing about Fear Street books is there is almost always a twist. Just like in Scooby-Doo. You think you know who the bad guy is, and then boom, the ghoul takes off their mask and exclaims why these pesky kids just don’t mind their own business. My favorite mystery series when I was growing up was Encyclopedia Brown. I thought it was so cool that he helped his Dad solve real police cases, and also helped his friends whenever something happened to them. My favorite part was how when Encyclopedia faced a real tough case he would think about it right before going to bed, and then wake up knowing the answer. 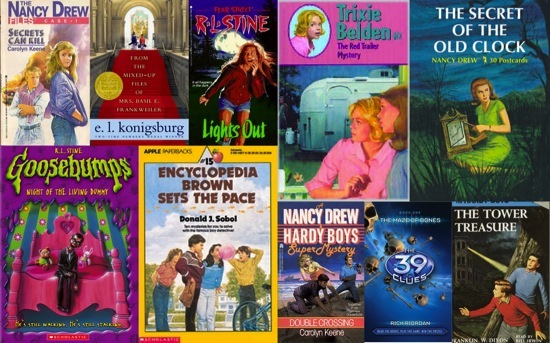 I loved the Nancy Drew series and spent most of my childhood thinking every old house had a secret passageway and every old desk had a hidden compartment (of course Scooby-Doo is partly to blame for this too). Besides the yellow hardcover originals, I also read the paperback Case Files that featured an updated Nancy rocking 80s hair and clothes. She will always be my favorite amateur sleuth. So what’s your favorite childhood mystery series? Please share in the comments!